You already have a working dual boot system. When you boot your system the Grub menu appears. You are prompted to choose between Windows and Gnu/Linux. Whatever the reason is you decide to reinstall Windows (not to be mistaken with resetting a Laptop to factory defaults which usually wipes all the hard disk). 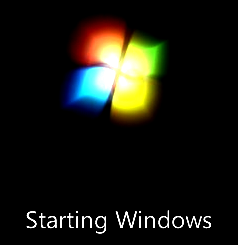 After having reinstalled Windows you realise that only Windows boots. There’s no longer a GRUB menu so that you can choose either Gnu/Linux or Windows. This error might show as error: no such partition. grub rescue> but you don’t have to mistake this problem with the one that happens when you delete Gnu/Linux partition when it lives next to a Windows OS. Most of the programs nowadays do care of reinstalling or restoring grub after restoring a Gnu/Linux partition. If your program isn’t doing it you can restore grub. Don’t be mistaken restoring a Gnu/Linux partition is not as straight forward as restoring grub after having the partition itself being restored but it is probably one of the steps you need to perform. If everything goes ok the next time you boot your computer your previously disappeared GRUB menu will be back. That means that you will be able to choose to boot into Windows or into Gnu/Linux again. Rescatux might be defined as a graphical click-and-fix Rescue suite which can boot alone. Rescatux is about 380 MB size. If you don’t have problems for such a download size it might be the best choice because you have other rescue options in the same media. Another advantage is that you don’t have to use the terminal at all in order to use it. This method uses Super Grub2 Disk which it’s a boot disk that will try to find all of your Operatings Systems and build a boot menu so that you can choose the one you want to boot from. 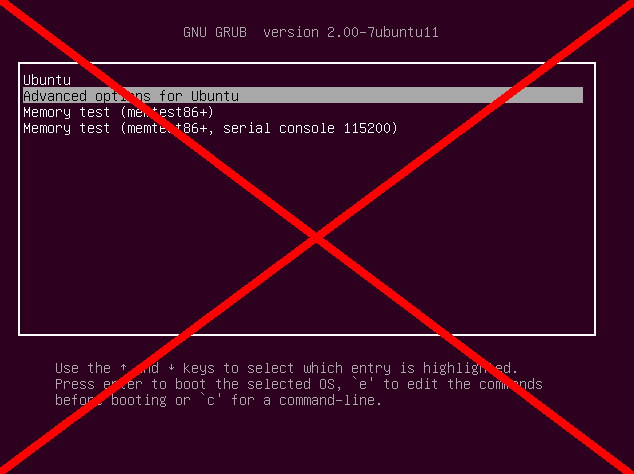 From inside your booted Gnu/Linux you will be able to restore Grub by using one straight-forward command. If you happen to have a very old Grub menu you can use the old Super Grub Disk that will restore grub by just selecting an option and pressing enter in most of the times. Trying to create a Super Grub2 usb disk but it fails. I used Unetbootin (latest version), still won’t boot from usb. Anyway I can buy a bootable usb with SGD2 on it ? CD ? no problem, but performance takes a hit. I’m going to update Put Super Grub2 Disk into an usb pendrive as an ISO image from Windows page today with Wubi based instructions that should work. 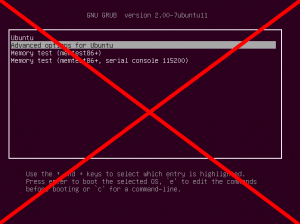 We don’t give support about how to install GRUB2 on USB. use thumbos, its superb !! You don’t really need performance for a rescue disk, so a CDROM would be fine. All you’re doing is reinstalling and reconfiguring the master boot record, and that stuff is small. But if you really want to use an USB… Have you tried pressing F12 on boot so you can choose what device to boot from? Some PCs does not have optical units, only USB ports. And to be a hell, some PCs does not see USB-CD as a bootable media, they only allow to boot from USB-HDD or USB-sticks (and of course from internal storage taht not allways is an HDD, sometimes if you open it it is a microSD). It is very tricky to boot from external media on such PCs, also more, one PC i saw if you delete internal bootloader, no longer can boot from any place, a huge very expensive brick. Officially advised tool is YUMI. If you use other tools don’t expect to be supported (No help if any of our tools do not boot) but feedback about them is welcomed. I recently built a new computer, my 3rd. Of course the hardware is designed compatible with windows. After assembly, an SSD with my Kubuntu OS would not open for reasons described in this presentation. I want my new system to function, an AMD 8 core, but after 20 years of Linux, I can’t stand the thought of having Windows as my primary Operating System, and I know you understand. I came to this site to look for a solution to the new problem, but am old and not intellectually gifted, so I am not sure I can help. Nonetheless, this is an important problem to solve, and I am willing to do what I am able. I am on a very low and fixed income, so if money is needed, my contribution will probably be almost meaningless to you but major to me. If you cannot find a use for me, thank you in advance for you knoble work. Please ask your question at the forum. From time to time I’m able to give some piece of advice in order to solve problems. We don’t give support in wordpress comments themselves. I have installed Debin 7 in my Apple Workstation. Now it is not booted and gave a message grub rescue> . What i do ? Pls help me. Use the forum for this kind of questions. Comments should only be used to the page contents discussion you are posting it in. Please use the forum for such questions. to boot each distro I wnetad to install from a LiveCD and install into the given partitions from there. However, with Backtrack I discovered that installing from the LiveCD would take up a lot more space than when I just installed it as a live CD using something such as Unetbootin. When using Unetbootin Backtrack only required 2.6 GB on my drive, but when installing to the drive using the LiveCD it required over 11 GB. Do I have to install them from the LiveCD or can I simply place the extracted files from the .iso in the partition and tell GRUB or whatever where to find them?Thanks. Please use the forum for such questions. The comments are only for the article you are commenting on only. Very very thank you for your work. I’ve had some trouble with dual boot (unrecognized partitions after new installation on a Samsung N150) and Super Grub2 Disk restore everything in few time, it may seem a little tool but has a big value for me. I want to make my own OS. How can i, can you please help me. This is not the right place for asking such questions. Not sure where to ask such questions though. Do some research on gentoo you may get some ideas. I have an old 32 bit machine (all linuxes) I did a dd of the 64 bit image to the USB stick. Is there more I should do to get the 64 bit machine to boot? I can’t find the instructions for making a bootable stuck. It worked with gparted.iso because there was a script for it. If it’s Rescatux you are talking about, yes it should work, if it’s 486, not if it’s 386. Well, it’s Debian based, don’t expect it to boot if Debian did not boot in the first place. If it did and Rescatux does not please submit a bug. Try to use Filesystem -> Filesystem Check (Forced Fix) from Rescatux on the affected partition and re-restore grub. Have downloaded both the stable release and the beta of Super Grub2 Disk, but neither OSX nor Ubuntu will make a bootable usb from it. The startup disk creator in Ubuntu repeatedly gives an error when trying to make the usb. And in OSX the Suber Grub2 Disk is not mountable in Disk Utility. Hey I found your help page and was wondering if you could help me with a strange problem. I was running a dual boot with windows 8 and fedora 21 and all was well until I decided to put fedora 22 on (for a triple boot) and right after I restarted my BIOS showed no boot anything but I know that the installation was successful. I really need help because it has me stumped. Thank you in advance. Just a note to those who are having problems producing a bootable USB drive. After (also) failing with Unetbootin, I succeeded with Rufus 2.2p. The only thing I don’t like about it is that it doesn’t recognise individual partitions on a USB drive like Unetbootin does, so will destroy any existing partitions when writing Super Grub2. But at least it works! Well, I do not know how Rufus works but the ‘dd’ method is the one more probable to work in any circumstances. More risky too. using dd to THAN clone the flash drive to another i have found fails. even tho it is an exact copy, the cloned flash drive has a different serial number. I have never heard anything about cloned flashed drives failing because of serial numbers. I guess it’s because of flash drives having different sizes. First of all thanks to Super Grub 2 I can perform all I need, meaning to boot from Linux Mint, OpenSuse AND GhostBSD. Booting from the 2 linuxes could also easily be done through the Grub 2, but Grub 2 refuses to recognize the BSD ufs partition ! Whatever explanation they all provide on the different forums, nothing seems to work. However Super Grub 2 find this partition AND I can boot from it. Unfortunately no changes are made to my Grub bootloader, so if I want to use my BSD OS I have each time to start my system with the Super Grub 2 CD and then select BSD. Is it not possible to update the GRUB with the correct data so that I do not have to start each time with the Super Grub 2 CD ? Try to install Grub 2 from git. In my Super Grub2 Disk releases you can check which exact commit I am using just in case it matters. It’s already included in every howto. But, yes, you are probably right. We will have to wait some time before I can implement these changes. Why all distros that let install Grub2 have a version lower than 2.02~beta3? With Grub version 2.02~beta2 and lower ones there is a BUG on command cryptomount -a that causes not to ask for all passwords (one per luks) and another bug that makes mounted one (crypto0) not let list nor access files on it and another bug that causes it to only run once, next runs do nothing. 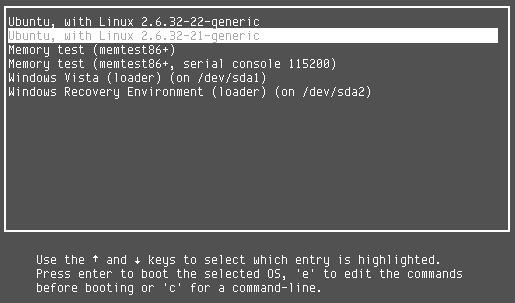 Commands are run in console mode of Grub2 (by pressing ‘c’ on main grub2 menu). SuperGrub disk has Grub2 version 2.02~beta3 so i could test with it and discovered i was doing things correctly, it is a BUG on previous versions. I can not find any LiveCD that can install Grub2 version 2.02~beta3, all have at most version 2.02~beta2. But i am afraid i have no skills to compile it by my self. Please ask your support questions (for the 2.02~beta3 guy) in the mailing list. read this with irionic tone: mailing list? i have no email account and do not want to have any. I do not want to be rude, just tell you i am trying to help others to not hit their head to a wall, sorry if i get bad understood, and in the way if someone has found a solution, i try my best to make he/she wnat to post it here, so all get such help. Also more… i discovered another bug on Grub, this time in [U]EFI boot mode while /boot resides on LVM. I will try to explain it so no people get mad on it. All manually tyining command, create partitions, lvm group, lvp partitions, format them, etc, then i reach to grub2-install, first i do it for target i386-pc, next for target x86_64-efi; so i discovered that BIOS boot works (having /boot inside the LVM) but [U]EFI boot do not work (error while lvm access). in short words: if booted in BIOS mode it loads Grub2 (having grub.cfg inside the radi0 lvm /boot partition), but if [u]efi booted grub2 can not read the lvm partitions, tells an error “error: disk ‘lvmid/****/****’ not found”. Such **** match vg volume and logical lvm volume, so they are correct. Boot secuence till error (on [U]EFI boot mode: power on, read EFI partition (physical, not inside lvm), read grub*.efi file, then grub start showing text on screen, then shows the error it can not access the lvm and stops; also trying to do a ls fails, etc. it get to grub rescue console but lvm is not accesible. When doing the grub2-install it told no errors found, but in the way it also showed something i think are errors (since on other scheme installs they are not shown), they are just two (identical) lines like this: “File descriptor 4 (/dev/sda2) leaked on vgs invocation. Parent PID ####: grub2-install”. As i said, changing boot mode to BIOS makes it to boot, booting from a CD in [U]EFI mode the lvm is accesible without problems, etc. I am afraid the bug is in the efi version of Grub2. I hope i could test with grub version 2.02~beta3, but i only can install grub version 2.02~beta2 till i find one livecd that let me install grub version 2.02~beta3, i have no skills to compile and create such livecd by my own, neither to compile grub version 2.02~beta3. >read this with irionic tone: mailing list? i have no email account and do not want to have any. >try my best to make he/she wnat to post it here, so all get such help. If you ever want feedback from us you will have to be subscribed to the mailing list or use the forum (wheneven we re-activate them). Both of these actions need an email. I found the real cause why Grub2 is not seen the lvm, it is not related to lvm, neither to Grub2. The problem is a root problem inside UEFI of VirtualBOX… i knew i was doing things well… but i was really blind. Now i know there are commands “map” and “devices” in UEFI console mode of VirtualBOX boot, i discovered the real cause of the problem. Now VirtualBOX will boot UEFI shell, press ESC key and see what “map” and “devices” commands shows. There is one FAT32 filesystem on each HDD, but they are not seen by UEFI shell, maybe this could be normal or not, but i ask to my mind one question, why devices do not show the other SATA HDDs? On Grub2 shell just type ls command and what? there are not all HDDs, only it is shown (hd0) (hd1) and (hd1,gpt1). Remember, i did not use anything related to lvm, ext*, etc… only FAT32 EFI partitions, so UEFI (at least is what i think) is supposed to see all SATA HDDs as DEVICES connected, i can understand UEFI do not mount more than one FAT32 partition, but devices not been seen i think is a seriour BUG. So, i am asking my self, if UEFI does not see all HDDs, maybe this causes Grub2-efi to not be able to see them too, but there is something extra very unnormal: Grub2 see (hd0) but not (hd0,gpt1), but it really see (hd1) and (hd1,gpt1). This maybe is related to have virtual cd on sata port 0, so maybe (hd0) is really the CD. So it preloads all modules needed to access fylesystems (i know ext2 is not needed and i had also tested without it, and with/without any of the others modules). The result is exactly the same, UEFI does not see all HDDs and Grub2 does not see them. So if HDD is not ever seen, any lvm that use that HDDs can not be seen. Hope this helps other to not get as mad as me… i lot more than one month because of this VirtualBOX Big BUG. Extra: Why Grub2-efi depends on the UEFI to be able to see the HDDs? All questions in this post are to make people think, not to be anwsered, here is not the place to ask such questions. I comment all this in hope that when i will be able to install grub2 version 2.02~beta3 could solve the issue / bug, but i am afraid it will not if really HDD seen depends on UEFI till VirtualBOX fix the Bug. Hope no one has a headage as me with this. In case you know you must do a simple test to ensure yout HDDs are been seen, check “devices” seen by VirtualBOX UEFI. One more test done, with same result: Grub2 can not see all the HDDs. I have tested to boot in UEFI mode on VirtualBOX with SuperGrub2 CD having grub2 version 2.02~beta3 and then press c key to go to grub shell, then type ls and see it only shows one of the 5 HDDs i have connected to VirtualBOX. Also using menus to detect and show all boot methods it only see one HDD, same for menu print devices/partitions. So finally i can conclude tha main cause is VirtualBOX does not present more than one HDD when in UEFI boot, i had tested with two different Grub2 versions, booting from a CD and botting from HDD with grub installed; i can not get any way to make VirtualBOX UEFI boot see more than one HDD, and Grub2 only see one HDD. If i use BIOS mode all works like a charm. I also got (in BIOS mode) to boot Grub2 from inside a LVM (3 stripes, like raid0) without any /boot partition, being /boot as a folder on rootfs; in other words: boot Grub2 with only one ext4 partition inside the LVM (defined over three hdds in striping mode) where /boot is really a folder inside that partition. 2.- The UEFI problem is a Big BUG on VirtualBOX (do not present to UEFI neither to Grub al the disks). Hope this can hep others to not get mad; it is not related to LVM itself, it is that VirtualBOX only let Grub access just only one HDD, the rest are not connected when booting in UEFI mode. P.D. : That Bug makes me lost more than one month, searching what i was doing bad, among i was really not doing anything bad, except be blind and do not see that all HDDs where not seen by VirtualBOX when on UEFI. Sorry, i am hera again, to clarify something i was also wrong about VirtualBOX UEFI boot. It indead can see two HDDs, but not three. 10.- See that devices command now shows two HDDs. VirtualBOX EFI only see HDDs that ar connected to SATA port 0 and port 1. I had tested to put HDDs only (no CD, no nothing else) and play arround changing sata ports, 0, 1, 2, 3, 4, 5, 6 and so on… i have seen that HDDs detected are only the ones on port 0 and port 1, the rest are ignored, as if they where not there. And i had also tested i can access both HDDs, read and write on them at same time (FS0: and FS1:), but only when they are on sata ports 0 and 1. Any disk on SATA port gretar than 1 is ignored, not seen, no access to it is possible. All test done in EFI console. I had test with more than 4 HDDs, if no one is on port 0 and no one is on port 1, EFI shows there is no disk present (command devices), but when one is on port 0 or port 1 it shows one HDD, and when two are on port 0 and port 1 it shows two HDDs. So now i can see what is really happening with VirtualBOX EFI, it only see HDDs on SATA Ports 0 and 1, the rest acts as if they where not there. And if i go to Grub console, i can also see one or two (only when are connected to sata ports 0 and 1). So i had tested to do all i was doing with LVM but using only two disks, and prior to power on virtual machine i configure both HDDs on ports 0 and 1, then power on and it works, grub is shown from inside an LVM in UEFI mode (but only with two HDDs). So confirmed, i was doing things perfectly correct, it was VirtualBOX EFI the one that do not let use more than two HDDs at same time (prior to boot any OS), no matter if LVM, or plain FAT32, the HDDs are not seen by EFI if ports to where are connected are greater than 1. Hope this really helps others, and hope Oracle solve that BUG soon. P.D. : I had tested my steps of LVM with a physical PC and 3 usb sticks (stripping) and it works like a charm (/boot as a folder also, no need /boot as a partition). ADD: VirtualBOX EFI console is plagged with BUGS, i discovered that if you type ls or dir to show files, but there is no file and no folder on the FAT32 partition is shows “Error. Incorrect parameter.” If after that you create a file (just with an echo a > FS0:\a) and then retype ls or dir, it shows the file is there, then delete it with del FS0:\a and it deletes the file, again type ls or dir and again the error message is shown. I am getting somehow angry: Virtual BOX EFI has meny bugs and do not let try configurations prior to go to real hardware, so i finally decided one thing, i will dedicate on full physical PC to do the tests and get rid of VirtualBOX (hopefully i have four very old PCs i can play with them and one not so old PC where i have my main Linux distro). Why i post all this here… just to say one thing: SuperGrub2 disc works great! and SystemRescueCD is also great to do this kind of tests (fast start, under a minute if docache is used at boot, it loads it self fully on ram). And also to make people understand that things that fail on VirtualBOX can be caused by VirtualBOX and not by Grub itself; so they not loose months like i lost trying to make things works inside VirtualBOX. And to help SuperGrubDisc people know of that BUGs so they get not mad trying to fix something on SuperGrubDisc, it is not Super Grub disc fault, it is VirtualBOX EFI that is very badly programmed. Just to finish: Thanks a lot for so great Super Grub2 Disc. hai,i had kali linux install beside windows10 (dual boot),on the bootloader only show the windows 10 OS,the kali linux is not,and i cant choose the kali linux to boot,how i can fix’s that? Sorry. No support in wordpress comments. Use the mailing list for support. I have problem with starting win10, it can”t boot normally,the following error “Boot manager not find”.But i can launch win 10 thru F12 “Choose peripheral for Boot”. Can i use supergrubdisk 2 to solve my problem, and how to use Supergrubdisk 2, is there a complete guide ? Please use the mailing lists for support. I tried twice to burn the Super Grub2 .iso expecting to have a bootable disc/CD when finished. It didn’t work and of course won’t boot, what did I miss along the way? Please use the mailing list for feedback where I’ll ask you for the specific iso you downloaded, your OS and the burning program you used.